This set up with linens, and shells is part of the set up for every ceremony. 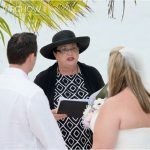 Simply Wedding - Grand Cayman Wedding Celebrants and Planners is located at 306 North Church Street in George Town, Grand Cayman, Cayman Islands. 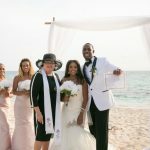 We specialise in cruise weddings on the beautiful beaches of the Cayman Islands, but many more locations are available to both visitors and residents. We do a limited number of registry office weddings in our office during office hours, which are Mon - Fri 9 a.m. - 3 p.m. Six guests maximum for Registry Office weddings. We provide most wedding services, in our wedding and vow renewal packages through our trusted wedding vendors. Ask about photography, videography, music, flowers, limousines, group transportation in new air-conditioned buses from the cruise landing, wedding cakes and much more. Our Marriage Officers do both religious and civil ceremonies. Male and female Marriage Officers available.. Personalise your wedding ceremony, different vows and readings available. 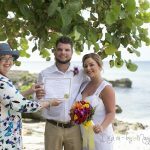 We work with all condos, hotels, and wedding planners in the Cayman Islands to provide the legal requirements for your Cayman Wedding. 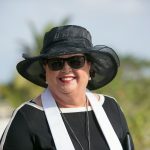 Call Joy or Peggy today at +1 (345) 9499933 to book your own Cayman wedding package or vow renewal.